where she daily posts her paintings. 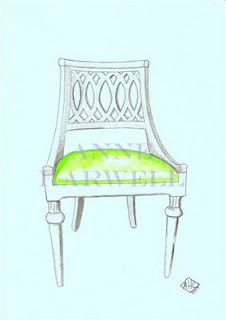 Anne has a wonderful whimsical approach to capturing the essence of her subject matter. I love her technique and she also has a fetish for chairs as I do, so I feel we are kindred spirits. She takes commissions for paintings. I am commissioning her to do a painting of a home that I designed that was featured in Architectural Digest December 2006. Stay tuned I will post this painting of hers when it is completed. There is nothing like a hand painted and hand rendered piece of artwork. I think it is an art form that we need to support and encourage artists like Anne to continue. So please give her your support in whatever way you can. Art and artists are our life blood and they need to be supported and encouraged in their creativity. 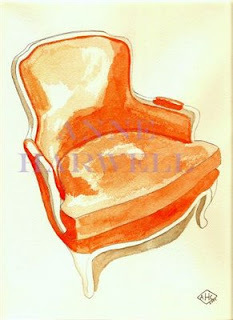 Here are some of her whimsical painting of chairs. I agree, it is wonderful to promote and support artists who are out there making a living on their art, and making the world a more beautiful place. I think that high quality original artwork really distinguishes a home, and elevates it to another level! Her work is just beautiful! I love looking at her blog each day. 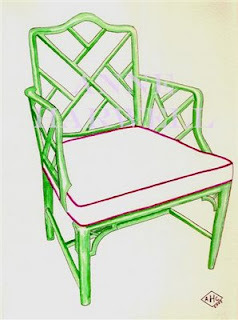 I can't agree more that hand rendering is a beautiful art form and it is in great danger of dying out. So few school are teaching hand rendering techniques. They put all of their emphasis on computer renderings. I have seen Anne's work and it is lovely. I can't wait to see the finished painting she is doing for you. Patricia: I KNOW exactly what chair she is going to do!!!!! I know!!!! It's not a secret, I can figure out. OK, I'm going to get a picture of a chair, too. I want one! 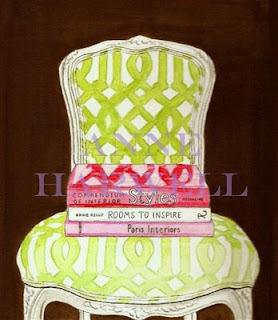 I absolutely love her paintings and in particular I love the recent painting she did for Courtney at Style court! I love Anne's art. 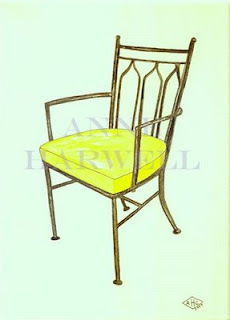 I have a print of Courtney's Chair, notecards, and The "You are Just my Type" Quote! 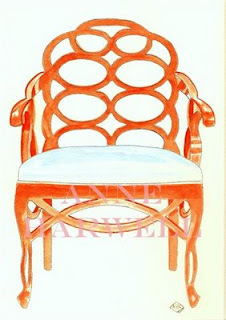 Nice painting of chairs... I love Anne's art which is beautiful and outstanding artwork.